These photos were taken on Thanksgiving Day 2017 as well as two days later. The locations were in my kitchen in Bethesda Maryland as well as in the Kitchen of one of my two sons at his home in Alexandria, Virginia. The "Take It!" 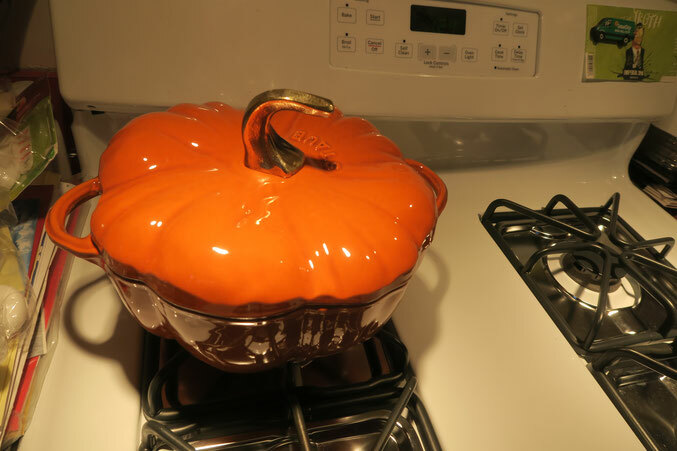 came from having bought a very cool looking pot at Bill Sanoma's several years ago with the thought in mind of using it for a favorite dish at a future Thanksgiving dinner. That occasion presented itself this year as I was invited to have dinner with the elder of my two sons, Brad, who lives with his lovely wife Kathleen, and their daughter, Gigi my Grand Daughter is an absolute delight. 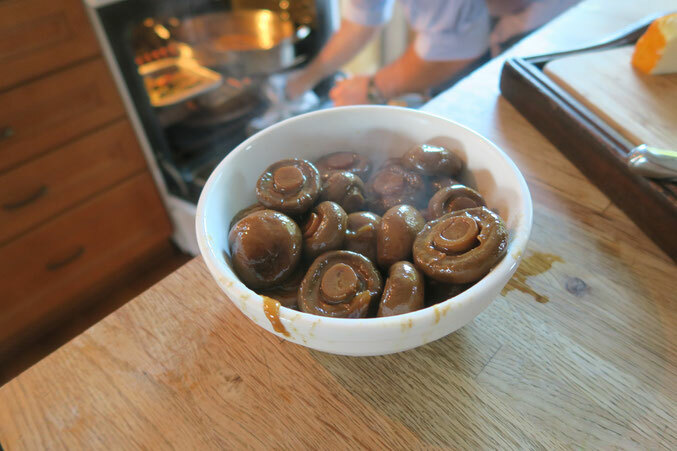 I had offered to whip up a batch of mushrooms which I had gathered the recipe for some years ago to bring as a contribution to the dinner. The offer was gladly accepted as they have gotten to be a favorite to those who have had them. And so the story begins. I gathered the ingredients from several locations as had through the course of time found where huge almost sweet,shallots are sold and in quite a different atmosphere, namely Costco, can always rely on their having fresh big white mushrooms, Brick butter was also purchased at Costco. The final item in the form of Chablis from California was purchased at a near by liquor store. The preparation for this is not to be rushed. There is lots of simmering done and the results are an almost assured delight. The entire process took far longer than I had remembered it to take for it had been several years since I had last made them. 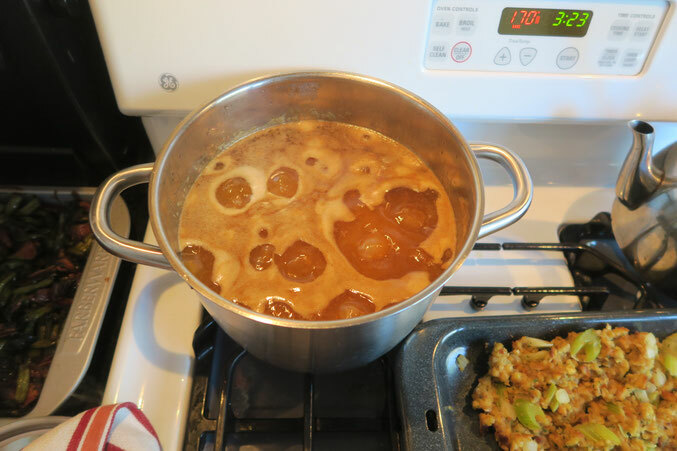 The grand plan called for my cooking everything using my big aluminum pot when everything was at full volume (pre simmering reduction) then finish it off in my smaller stainless pot which is a breeze to wash up when finished with it. Then, last but not least, the transfer out of the stainless pot and into the still in the box brand new Pumpkin Pot to be delivered and make its way to the dinner table as the final warming vessel and then used for serving as well. It was with eager hands that I took the pot out of the box and proceeded to get it de ribboned ready to be giving a quick soap and water washing before using it. All went well until I lifted the lid and found an inspection sticker from a lady with a very French name who had perhaps applied it with pride in the very center of the inside on the floor of the pot. I began the what I thought was to be the easy picking off of this symbol of excellent care, using my usual thumbnail as the tool of choice as did not want to harm the Teflon coating which was the inside liner. I have no idea of what type of glue they use, but in all my years of label removing, I had never met one so stubborn in its reluctance to part the ways with its travel partner from one continent to ours. I simply ran out of time, and the mushrooms made their final journey in the less glamourous Stainless Steel. But for the fate of a sticky stickier, this set of pictures would not have been taken, and this ever so small story of a part of what was a dinner of delights would not have happened, to be shared. 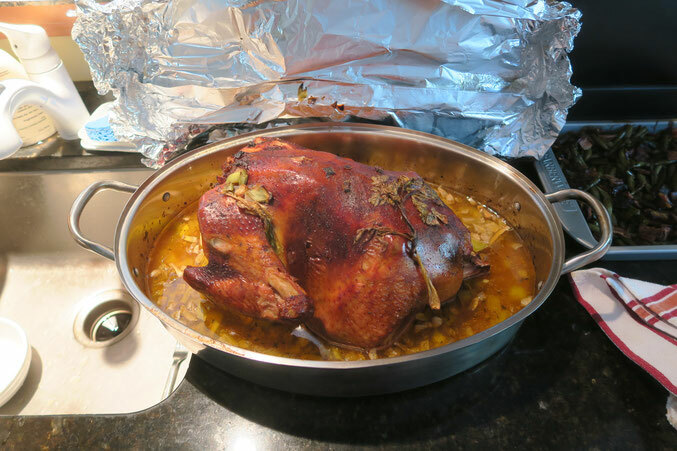 Here is hoping each of you had a wonderful Thanksgiving, and are now savoring tasty left overs. Sending my best regards, before I place Mr Pumpkin Pot (now that it has been unstickered and washed) onto a shelf and at the ready for next year. PS: I am happy to report each and every item served at the dinner, was prepared to perfection. The Turkey was perhaps the most moist I have ever had the pleasure of eating, all else were in supporting roles (including the rolls). Best was the chance to share the companionship of some of the Family, with thoughts of those not with us, very much in mind. Looking at these pictures I'm already ready for next Thanksgiving. I'm actually hungry now lol. That pumpkin pot looks so familiar, have you shared that with us before? Wow those mushrooms look fantastic. They are incredibly plump, they must have a ton of flavor. I have always sautéed them, I've never done a slow simmer with mushrooms. After seeing them I am going to have to give it a try. If you don't mind me asking, how long do you let them simmer? I hope you and your family had a wonderful Thanksgiving. The food looks delicious, hope you had lots of leftovers.